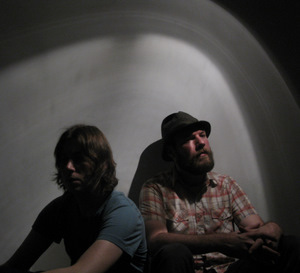 The duo of Brendon Anderegg and Koen Holtkamp known as Mountains are one of the new generation of Thrill Jockey bands. The band’s new album on Thrill Jockey is their third album since 2005– the first two released on the their own label, Apestaartje. Mountains synth-plus-guitars sound is typically compared to Brian Eno or Fennesz and their 2009 release Choral is a collection of ambient tracks that seem to build by layer and utilizing spare melody structure. The delay and echo of the pieces also remind me of Michael Brook. According to their PR, Mountains love to sculpt their sound in front of a live audience and we will be able to experience that here in Eastern Iowa when they perform at The Picador in Iowa City on Friday, April 24th. At this point, the show is not listed on the Picador calendar, so I don’t have any more details. I’ll try to update this page as I get more information. Click Here to visit the Choral page at Thrill Jockey and listen to high-quality streaming tracks from the album.